Does perfectionism affect you and your loved ones? It’s a sneaky coping mechanism (flesh pattern) that can cause a lot of frustration, shame and pain. 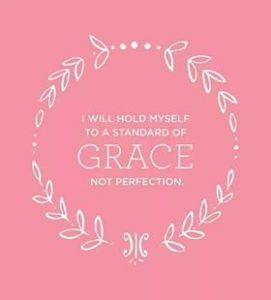 The dictionary defines perfectionism 1. as a personal standard, attitude or philosophy that demands perfection and rejects anything less. 2. Any various doctrine holding perfection is attainable. 3. Attaining the highest degree of proficiency, skill or excellence. Let’s dig down underneath the desire to be perfect. Did you know it is actually inherited from our great, great, great, great, great, great, great, great…grandfather, Adam. Adam and Eve were created for perfection so the desire is innate. But we cannot attain it on our own. As you know, everything changed when they disobeyed God in the garden of Eden. Sin entered the world along with a spiritual death to all mankind. HOWEVER, Jesus came and redeemed this horrible choice and fixed everything when we place our trust in Him and what HE did for us on the cross. So what’s the answer to this nagging obstacle that trips us up? First of all we have to understand that we have been given a new identity In Christ. God separates identity from behavior. This is really hard for us to do. HE entered our spirit and made us a new creation. What is true about Jesus is now true about you in your Spirit. Our spirit determines our identity. Yes behavior can cause us some issues and pain but it does not change our identity. Yes, God will deal with behavior for our good but first and foremost HE chooses to change our behavior by convincing us of our new identity. The Bible says, “His goodness brings us to repentance.” Do you know how much HE loves you and how much HE has done for you? When we place our faith in Him HE gives us so much more than a ticket to heaven; He gave us HIMSELF. He gave us HIS IDENTITY. His holiness, righteousness, love, forgiviness, security, safeness, kindness, patience, gentleness and PERFECT identity. Does that mean we always act holy, righteous, loving, forgiving, secure, safe, kind, patient, gentle and perfect? Of course not! Our behavior is separate from our identity and we are humans living in a fallen world. Let me give you a quick example. If I sit here and bark like a dog, am I a dog or a human being? If our child is making bad choices is he a “bad boy” or is he your beloved child that is making a bad choice? Do you see the difference? What we believe about ourself will determine our behavior! If I believe I am bad or told I am bad, it makes perfect sense to be bad. If I believe I must be perfect in my behavior I will work my fingers to the bone trying to perform perfectly and it will only end in frustration and broken relationships. Why broken relationships? Because what we expect of ourselves we also expect of others. This causes a judgemental, critical and condemning view on ALL people. We can get off of the performance treadmill. We can enjoy and rest in who we are In Christ and trust HIM to change our behavior and stinking thinking in His time and in His way. Often we tell our clients the following statement. Truth is what God says regardless of how I feel, believe/think or act! Listen to Matthew 5:48 – “You are to be perfect, as your Heavenly Father is perfect.” What in the world is Jesus talking about? In the gospels Jesus is often trying to show his listeners that they cannot obtain their own righteousness. They really believed that they could. All through scripture you see God’s people asking for more rules and more guidelines. WE CAN DO IT was their motto in life. Jesus was trying to show them that they cannot do it and that is why they need a savior. Now listen to Hebrews 10:14 – “For by one offering (Christ death, burial and ressurection) HE has perfected for ALL time those who are sanctified.” (Sanctified merely means set apart, those who have placed their faith in Him.). So let’s get off of the performance treadmill and enjoy our identity in Christ. Human’s are not perfect in their performance and never will be. When we make mistakes we recognize and grow from our mistakes. If we need to make something right with a person it is consistent with our true identity to make it right with this person. God wants us to ENJOY the entire package of what we got when we entered HIS family. Heaven, Identity, Rightness, Security, Safety, Access to the throne, Empowerment, Peace, Joy, Forgiveness, and a whole list of many other wonderful gifts.